The Ten Principles of Burning Man have a great deal of meaning to us who identify as burners. I’ve designed the Ten Symbols inspired by these principles, which I’d encourage you to share and use yourself as visual inspiration for practical manifestation in your life. I’ve designed these symbols with a Creative Commons BY-NC-SA license which allows you to copy, distribute, and adapt the designs for non-commercial purposes, as long as you credit the original sources. 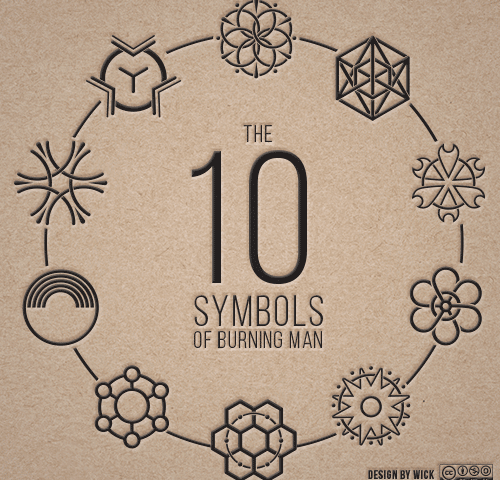 So which symbol represents each of the Ten Principles of Burning Man? Scroll down to see The 10 Symbols. These symbols are free to use for non-commercial purposes. Use them at your regional burn, remix them with your art, gift them to your community, and share them with the world! Download the scalable & printable PDF. It would mean a lot to me to see where you incorporate these symbols. Be sure to share your creations, and get in touch.